Outdoor furniture cushions offer durable seating. Whether you are building an outdoor furniture cushions seating area or need new outdoor furniture cushions, our outdoor furniture cushions will make it even more inviting. Which foam is best for outdoor use? Outdoor furniture cushions have been around for a long time. Originally, outdoor furniture cushions were made out of polyester pillow fiber. Most factories still produce outdoor furniture cushions this way since Chinese polyester fiber is so cheap. Like an old bed pillow, polyester fiber can flatten down in a short time. 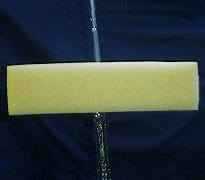 Once foams came into use, a long-lasting and comfortable solution was found. Outdoor foam is polyurethane foam and is so porous that water can literally flow through it. It manages this while still being able to come in a range of outdoor furniture cushions firmnesses. This means that you can have firm or plush outdoor furniture cushions that will sit through rain and still quickly dry for use a short time later. Read on at the bottom of the page for more info on outdoor furniture cushions. To receive a price quote on outdoor furniture cushions, please click the image that most closely resembles the cushion you need. 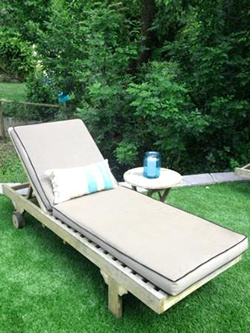 We offer a range of qualities of outdoor furniture cushions foam fillers. Keep in mind the more the outdoor furniture cushion is used the higher quality foam inside is needed. While there are lower quality and much lighter and cheaper outdoor furniture cushions foams available, these tend to soften over time rather quickly. Quality outdoor furniture cushions require a more expensive grade of foam to last. If you are looking for outdoor Furniture cushions that won't be exposed to weather, you can also consider using a conventional foam or Natural Sense 100% natural foam (which is naturally mildew resistant). You can make almost any foam work as an outdoor furniture cushion — for example, by adhering a polyester Dacron wrap batting to one side of the foam will improve provide airflow. Once you have decided what to put inside your outdoor furniture cushions, next choose a fabric. We sew fabrics twice, inside and out, using an over-locking stitch, to ensure they don't unravel when cleaned. While this doubles the labor to make our outdoor furniture cushions, it is worth it. Outdoor furniture cushions exposed to direct sunlight or rain need a proper fabric like Sunbrella ® or Marine grade vinyl. Sunbrella ® makes a beautiful line of fabrics for this purpose. This line has many color and pattern choices for outdoor furniture cushions, and works wonders outside or indoors. This is one of the top choices for encasing outdoor furniture cushions. Be wary of our discount cotton covers; while they are fine for areas with little to no exposure, they are prone to fade, shrink, and fall apart if exposed to the elements. They are a poly/cotton material. For the highest quality products and best customer service, buy your outdoor furniture cushions from Foam Order.com. Had been looking for someone to do custom sized pads for an outdoor seating area. Found Foam Order online and they were able to fit my needs. Attention to detail, well made, easy to work with. I highly recommend them for any pad application you may have. I ordered a long seat cushion and irregularly shaped bolster for an indoor TV viewing area. The cushions came back made to my exact measurements, with the foam solid and comfortable. The covers went on without much difficulty and fit very nice an snug. I love the look -- extremely satisfied!